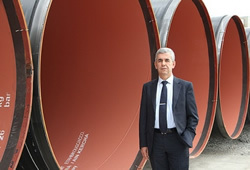 Ahmet Guven, Managing Director of Emek Boru (Piping), one of the steel pipe suppliers of Trans-Anatolian Natural Gas Pipeline (TANAP) Project stated that anti-damping investigation opened against steel pipe import should not affect the project. Mr. Guven also stated in his announcement given to a correspondent from Anadolu Agency (AA) that ongoing anti-damping investigation may take a year but meanwhile they are obliged to make provision of raw materials. Stating that they held interviews with Ministry of Economy in this case, Mr. Guven said “They have been aware of the situation and expressed that they would take this situation from the perspective of raw materials which are procured within the scope of TANAP into consideration”. Pointing out that the said raw material’s source is in abroad, Mr. Guven said “Anti-Damping investigation opened against steel pipe import should not affect TANAP”. “Raw material manufacturers in Turkey do not have the capacity to possibly and properly meet steel capacity requirement of this project yet. They might meet the quality but they are not capable of supplying raw materials for monthly production rates of 5 – 6 steel pipe manufacturers in Turkey. Therefore, we had a necessity for import when we started this project. Of course we want to procure raw materials from local producers in further stages of the project but this would be limited with the amounts they can offer”. Mr.Guven also stated that steel pipe provisions will continue till February 2017. Mr.Guven, declaring that they would like to take a place in pipeline project planned to be done from Russia to Turkey, said “We aim to take place not only in Turkish Flow but all surrounding natural gas pipeline projects”. Ministry of Economy had started anti-damping investigation in January against import of parts used for manufacturing iron or steel pipes, with origin of China. Steel pipe manufacturers defend that local raw material production capacity is limited and not able to meet the needs against anti-damping application made by local raw material producers. Ceceli who answered questions of the AA reporter dubbed the contractor firms as the “Turkish national team” and told that their priority is Turkey and told that “The gain here is foremost a gain for Turkey after all”, further noting that the Chinese companies had contemplated to gain the entire project but failed in this prospect. Stating that taking place in TANAP is a source of prestige, Mr. Ceceli expressed “Taking place in such project is a matter of worldwide important reference because this project is a world-known substantial project. It is a project known by pipeline contractors, gas dealers and buyers in the world”. Telling that project has both advantages and challenges, Mr. Ceceli said: “VAT exemption includes TANAP only. We hope that this law would be expanded to include suppliers too. This inclusion would save us from paying an amount in the first place, which we will retrieve from government by means of offset and/or return in long term. Unless it is expanded, it would be a burden for us. But most importantly, customs duties will be a more serious cost item for us. This is a common problem for all 6 Turkish companies involved in the project. This VAT and customs duties issue is a problem for all of us. VAT exemption defined here is an advantage in terms of TANAP, however that advantage reflects to us as a disadvantage. We have the opportunity to get a return for 18% VAT, but this would be a burden for us in a certain timeline at the beginning. And this has temporal and monetary cost. All of these have an economical, financial burden brought for us until realization”. Ceceli also stated that they paid 10% tax for raw materials imported within the scope of TANAP and the first delivery would be done in March. Procurement contracts for pipes of TANAP’s main lines have been signed. 80% of the tender held for approx. 1800 km main line piping is won by Toscelik, Borusan Mannesmann, Erciyas Boru, Emek, Umran and Noksel. Regarding Trans Anatolia Natural Gas Pipeline (TANAP) project’s main line piping tender Minister of Energy and Natural Sources Mr. Taner Yildiz said “I would like to congratulate our domestic piping industry manufacturers for showing a high performance in this regard, congratulations. Because that was an open tender. Because that was an open tender. There were 18 companies from different countries that participated in the tender but Turkish industrialists have shown a high level of performance and at least 80% of the pipeline works were assigned to them. Trans Anatolian Natural Gas Pipeline (TANAP) project’s Main Line Pipes Procurement contracts signature ceremony is held with participation of Turkish Prime Minister Ahmet Davutoglu as well as Economy Minister Nihat Zeybekci, Customs and Trade Minister Nurettin Canikli, Chair of SOCAR Rövnag Abdullayev and bureaucrats from winning consortium. Mr.Yildiz making a speech during the ceremony told that the project in which TANAP is involved has four main rings, first ring is the line produced in Caspian and coming to the border of Georgia, second is the line coming from Georgia, third is TANAP between Turkey and Greece, and fourth is the line ranging from Greece to Italy. Pointing out that project would be completed upon completion of all these rings, Mr. Yildiz also stated “All of it costs 45 billion dollars. These would be realized upon spending every cent of 45 billion dollars. We right now are at one of the most important cornerstones of TANAP to pass 21 provinces across Turkey”. “This project not only concerns supply security of Turkey, but also an important step in being a part of the solution related with the supply problem in natural gas supply of EU member states. Today, we altogether see that Turkey’s stability gains higher importance at a point where chaos rises, crisis occurs successively in many countries around Turkey within our territory where international politics discussed ever more. Energy projects will be catalyzer for peace and become a very serious constructive factor in international relations. TANAP is one of them. These projects of us will continue. Why not Mediterranean be like this? We have to think why such projects cannot be realized with our eastern and southern neighboring countries”. Mr. Abdullayev, CEO of SOCAR and TANAP stated that inter-governmental and host country agreement signed between governments of Azerbaijan and Turkey regarding TANAP in June 2012 strengthened cooperation in energy sector even more. Highlighting that this is one of the most strategical steps taken ever on the way of Turkey to become an energy corridor within the world’s geography, Mr. Abdullayev told that natural gas to be shipped from Azerbaijan when Southern Gas Corridor investment is finished will pass Georgia and arrive to Anatolia and after passing approx. 2.000 km long TANAP pipeline incorporated with Trans Adriatic Pipeline (TAP) and reached to Europe over that. Mr. Abdullayev continued: “Azerbaijan would support Europe’s and Turkey’s increasing energy demand and supply security thanks to the opportunities created by Southern Gas Corridor. We have to count the benefits to be gained thanks to TANAP project, through Turkey’s becoming an east-west energy corridor, empowering its upstream position, tax incomes, transportation and portfolio revenues, generating 15 to 20 thousand new employment opportunities, development of Turkish pipe manufacturing and pipe construction sector and new undertakings around the world by showing TANAP as reference”. Stating that 80% of total pipe amount as a result of tender held for main line piping work is undertaken by 6 Turkish firms, Mr. Abdullayev expressed “TANAP also plays an important role in increasing experiences of Turkish industrial sector regarding international projects”. After speeches, Mr. Abdullayev signed the agreement with authorized persons from Baosteel Europe GmbH, Borusan-Noksel-Erciyas consortium, Toscelik AŞ, Umran Celik – Emek Boru AŞ consortium. Piping works of Trans Anatolian Natural Gas Pipeline (TANAP) project will be done by Turkish firms. It is declared from Public Disclosure Platform (KAP) that Turkish firms won the tender on procurement of approx. 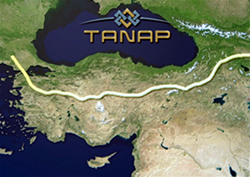 1,2 million tons of steel pipe to be used in Trans Anatolian Natural Gas Pipeline (TANAP) project with 1900 km long targeting transportation of natural gas drilled within Caspian territory to Europe over Turkey. Following comments took place in the declaration made to KAP by Borusan Mannesmann Boru Sanayi ve Ticaret AŞ: “regarding procurement of approx. 1,2 million tons of steel pipe to be used in Trans Anatolian Natural Gas Pipeline (TANAP) project with 1900 km long targeting transportation of natural gas drilled within Caspian territory to Europe over Turkey; the consortium under leadership of our company Borusan Mannesmann Boru Sanayi ve Ticaret AŞ, including Noksel Celik Boru Sanayi AŞ and Erciyas Celik Boru Sanayi AŞ has gained the pre-qualification right as a requirement for participation to tender on 27.01.2014 and within the scope of tender process, submitted its tender dossier to tender organization on 15.04.2014. Concrete developments regarding the project are announced to our stakeholders through Public Disclosure Platform (KAP). TANAP Natural Gas Transmission Co. following its overview done on our tender dossier including commercial and technical information submitted by consortium under our leadership, informed by means of a notification about its decision that approx. 30% of total steel pipe need to be procured within the scope of project would be met by our consortium. The contract to which the consortium that our company has 1/3 shares will be a party costs 420 million (transportation inclusive) USD. It is estimated that shipments of steel pipes to be supplied within the scope of project would be completed in a 24-month period; and sensitivity will be displayed as required, in order to complete the project in a timely manner, which has a vital position in terms of both our company and Turkey’s economy”. At the ‘Trans-Anatolian Natural Gas Pipeline Project’ that targets to transmit the Azerbaijani natural gas to Europe, 7 companies, including 6 Turkish ones were found eligible. Chinese Baosteel Europe, Borusan-Noksel-Erciyas consortium, Tosçelik AŞ, Ümran Çelik-Emek Boru A.Ş. consortium signed their contracts yesterday. 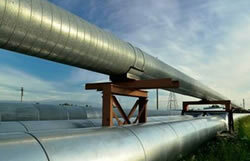 80% of the Trans-Anatolian Natural Gas Pipeline Project (TANAP) mainline pipe tender was awarded to Turkish companies. Prime Minister Ahmet Davutoğlu underlined that TANAP is a peace project, whereas Taner Yıldız, the Minister of Energy and Natural Resources told: “I congratulate our national pipe industry manufacturers who have shown a high level of performance here. Because that was an open tender. There were 18 companies from different countries that participated in the tender but Turkish industrialists have shown a high level of performance and at least 80% of the pipeline works were assigned to them.” Eligible companies have been Chinese Baosteel Europe GmbH, Borusan-Noksel-Erciyas consortium, Tosçelik AŞ, and Ümran Çelik-Emek Boru AŞ. Trans-Anatolian Natural Gas Pipeline Project (TANAP) announced the names of the companies that will be invited to the tender on mainline steel pipe production. The fact that 6 of the companies and joint venture groups invited to to the tender for mainline steel pipe production for the Trans-Anatolian Natural Gas Pipeline Project (TANAP) are Turkish companies was met with gratitude by the representatives of the steel industry. Yayan, further declaring that projects such as TANAP can appear before Turkey only in 5-10 years, told that pipes and sheets used in such projects should be procured from domestic actors as much as possible. In the release made yesterday, companies to be invited to the mainline pipes procurement tender were announced. Accordingly, 18 companies including one joint venture group were invited to the tender and 6 of the said companies are domestic participants. Pipe procurement contracts for TANAP were signed today. 80 per cent of the Works was assigned to Turkish companies. Pipe procurement contracts for the Trans-Anatolian Natural Gas Pipeline Project were signed. 80% of the contracts at the end of the tender procedure started for approximately 1800 kilometers of mainline pipes in TANAP were awarded to companies Tosçelik, Borusan Mannesmann, Erciyas Boru, Emek, Umran ve Noksel. Contracts of pipe procurement were signed today. Prime Minister Ahmet Davutoğlu who spoke at the signature ceremony of the TANAP mainline pipe procurement contracts told that the Project is a project of peace and shall act to further bolster the friendship between the countries located on the pipeline’s route. Prime Minister Davutoğlu further emphasized that TANAP will present brand new opportunities in each and every sense and particularly function as a tool to meet Turkey’s demand of energy and for conversion of Turkey into a location where the Balkan and European demands in energy are met. He added that the fact that 80% of the construction works at TANAP has been assigned to Turkish companies constitutes a proof of the level of advancement for the Turkish industry. Turkey’s share in TANAP was increased to 30 per cent after the latest purchases. The largest share in the project, one third of the Works with a total quantity of 1 million 200 thousand tons will be implemented by Tosçelik. TOSÇELİK: Board of Directors Chairman of Tosçelik is Fuat Tosyalı who is also the President of the Tosyalı Holding. Companies Tosçelik profil ve Sac Endüstrisi A.Ş. , Tosyalı Demir Çelik Sanayi A.Ş.,Tosçelik Granül Sanayi A.Ş, and Tosyalı Dış Ticaret within theTosyalı Holding structure makes the entity the most prominent private sector investor of Turkey in the iron & steel industry. The company headquarters was moved to Ankara from Hatay and the company maintains a high number of manufacturing plants, most notably in İskenderun but also in Osmaniye, İstanbul, İzmir, Algeria, Serbia, and Montenegro. The triple consortium composed of Borusan-Mannesmann, Erciyas Boru, and Noksel Boru will produce around 300 thousand tons of the Works. NOKSEL: Noksel was founded in 1987 to manufacture spiral welded pipes for domestic and international markets to be used in petroleum, natural gas, and water transmission lines as well as other various industries and the company has been a producer of longitudinally welded steel pipes since 2001. Partnership structure is composed of the Çukurova Group holding the majority shares and the companies Finnish Fund For Industrial Co. Ltd., and Başarı Yatırımlar San. Ve Tic. A.Ş. ERCİYAS: Erciyas is owned by Ahmet Kamil Erciyas. Its Board of Directors has Burhan Karaçam, the former General Manager of the Yapı Kredi Bank. Erciyas Çelik Boru Sanayi A.Ş. was founded in 1990 in İzmit for production of spiral welded steel pipes. The company has a Düzce factory with a capacity of 450,000 tons. This factory produces pipes for petroleum, natural gas, and water pipelines as well as poles. BORUSAN MANNESMANN: Ümran Boru and Emek Boru were awarded the 200 thousand ton portion of the project. Borusan Mannesmann, founded as the first industrial investment of the Borusan Group in 1958 currently has a production capacity of 1 million tons. With a product line of 4,000 types, the company provides for a number of industries, most notably construction, energy, and automotive industry. Borusan Mannesmann exports 60% of its production and supplies 30% of the Turkish steel pipe exports. In 2012, the company took a giant leap in the course of globalization and decided to found a steel pipe company in the USA with an investment of 150 million dollars. According to the 2012 İstanbul Chamber of Commerce Index, Borusan Mannesmann is the 44th largest industrial company in Turkey. 93.3 per cent of the company shares are held by Turkish shareholders and 6.7% belongs to foreign shareholders. Ümran Boru and Emek Boru were awarded the 200 thousand tons of the Works. ÜMRAN ÇELİK: The company has a turnover of 100 million lira and the largest shares, 20 per cent each, are owned by Orhan Yavuz and Gönül Yavuz. Zeynep Bilge Rızvani has a share of 19 per cent. Orya Holding is also a shareholder in the company where the Buğdaycı Family has a share of 19 per cent. Company has its headquarters in İstanbul and their manufacturing plant in Ümraniye has an annual capacity of 200 thousand tons, whereas their manufacturing plant in Akçakoca has an annual capacity of 750 thousand tons. Orya Holding is the contractor of the Cide HPP Project. 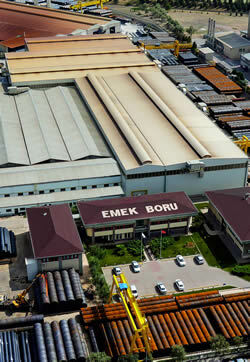 EMEK BORU: The company was started in 1983 and joined the Ceceli Group in 1990. The manufacturing plant is located in the Ankara 1st Organized Industrial Zone on an area of 100,000 m2 including an indoors area of 30,000 m2. Board of Directors Chairman of the company is the businessman Şerafettin Ceceli who hails from Çankırı. 80% of the contracts at the end of the tender procedure started for approximately 1800 kilometers of mainline pipes in TANAP were awarded to companies Tosçelik, Borusan Mannesmann, Erciyas Boru, Emek, Umran ve Noksel. 6 Turkish manufacturers composed of Borusan Mannesmann-Noksel-Erciyas Consortium, Ümran-Emek Consortium, and Tosçelik Profil ve Sac Endüstrisi were awarded the 80 per cent portion of total scope of Works, whereas the remaining portion shall be provided by the company Baosteel Europe, a foreign supplier. 6 Turkish companies and a Chinese company with German headquarters signed the contracts today. The contracts executed require that about 30% of the pipes shall be supplied by the Borusan Mannesmann-Noksel-Erciyas consortium, about 25% to be supplied by the Ümran-Emek consortium, about 25% to be supplied by Tosçelik Profil, and 20% to be supplied by Baosteel Europe GmbH. While no declaration was made concerning the total price of the Contracts, Borusan Mannesmann, in its press release published in KAP this morning announced that the price of the steel pipe contract signed by the Borusan consortium is 420 million dollars. According to the press release, under the relevant contract, 140 billion dollars were assigned to Borusan Mannesmann and the amount that corresponds to the partnership share is on the level of 26.5 per cent to the company’s gross sales revenues for the year 2013. It is expected that shipment of steel pipes shall be completed in 24 months. TANAP, where Turkey has 30 per cent share, will have the Azerbaijan-Georgia-Turkey-Greece route and end up in Italy, covering a pipeline project of investment forecast of 45 billion dollars and the Turkish share shall be related to investments in Turkey. Tender procedure for TANAP mainline pipes was started by invitation of the 18 domestic and foreign companies that were awarded preliminary eligibility on the date February 14, 2014 and bids were received on the date April 14, 2014. It is planned that the Project shall import the first flow of gas of 6 billion cubic meters to Turkey in 2018 and the first transmission of gas to Europe shall start in the year 2019. Construction Works of the Project will be separately procured. Taner Yıldız, the Minister of Energy and Natural Resources, who spoke at the signature ceremony of the mainline pipe procurement contracts told that expropriation procedures concerning TANAP have started and Project design, route designation, and EIA procedures are in progress. Yıldız underlined the significance of the fact that 80 per cent of the supply works have been assigned to domestic companies and told: “More than 50.000 train and TIR transports shall be implemented for transfer of the pipes to the route. Consequently, a very serious quantity of circulation, particularly at the İskenderun port shall be initiated.” Yıldız further emphasized that the Project will become part of the solution to Europe’s problem in energy supply and TANAP and similar energy projects shall act as a catalyst for peace. 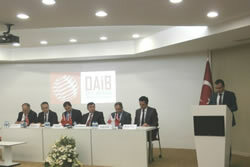 Ankara Ferrous and Non-Ferrous Metals Exporters’ Union Elective Regular General Assembly was held on the day April 17, 2014 at the General Secretariat Service Building. The meeting that was initiated with an opening, one minute’s silence, and İstiklal Marşı continued with a presentation by the Board of Directors Chairman Mehmet Zahid Poyraz on our Union’s 2013 operations and the working report for the year 2014. At TANAP, for Works of a quantity of 1 million 200 thousand tons, the section of 400 thousand tons that makes up almost one third of the Works shall be supplied exclusively by Tosçelik. The section of approximately 300 thousand tons was assigned to the triple consortium composed of Borusan-Mannesmann, Erciyas Boru, and Noksel Boru, while the section of 200 thousand tons was assigned to the group composed of Ümran Boru and Emek Boru. While no declaration was made concerning the total price of the Contracts, Borusan Mannesmann, in its press release published in KAP this morning announced that the price of the steel pipe contract signed by the Borusan consortium is 420 million dollars. Consortium with the composition Borusan-Erciyas Boru-Noksel Boru won the tender to the 30% portion of the Project with a contract price of 420 million dollars. Around 1,350 kilometers of the Project will be built with 56-inch pipes and the remaining 450 kilometers will be built with 48-inch pipes. Pipes of six different wall thicknesses will be manufactured for the Project. 80% of the pipes in TANAP that will have a total scale of 45 billion dollars and transmit the Azerbaijani natural gas to Europe will be provided by Turkish companies. After speeches, Mr. Abdullayev signed the agreement with authorized persons from Baosteel Europe GmbH, Borusan-Noksel-Erciyas consortium, Toscelik AŞ, Umran Celik – Emek Boru AŞ consortium. Signature ceremony for mainline pipes procurement contracts of the “peace project” TANAP was attended by the Prime Minister Ahmet Davutoğlu and also the Minister of Energy Taner Yıldız, the Minister of Economy Nihat Zeybekci, the Minister of Customs and Trade Nurettin Canikli, and the SOCAR Chairman Rövnag Abdullayev joined by the representatives of the consortium the contract had been awarded. The initial signature concerning the Project was between Azerbaijan and Turkey in June 2012. Completion of the line of 1800 kilometers shall bring a cost of 45 billion dollars. Natural gas exploited from the Caspian Sea will be transferred to Georgia through the first line. The second line will reach Turkey from Georgia and yet a third will pass through 21 Turkish provinces and reach Greece. The fourth line will transfer the gas to Italy from Greece. Entire Project will be completed in 4 years. 15-20 thousand people will be employed during this period.